This was the third or fourth time I'd seen The Thing From Another World (1951) and the first time in almost 15 years. It didn't quite hold up as well as I remembered—some of the dialogue and performances left me cold (bad pun)—but it's still a solid Hawksian thriller featuring his trademark rapid-fire overlapping dialogue delivered by a mostly good cast, assured direction, an eerie theremin-imbued score by Dimitri Tiomkin and some impressive action scenes for the time. 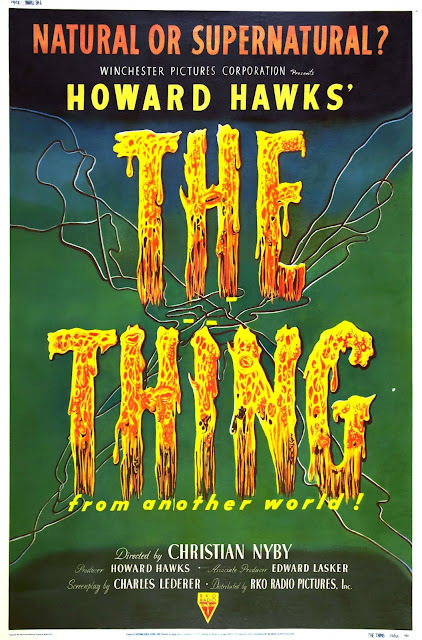 While I do greatly prefer John Carpenter's bleak 1982 version of John W. Campbell Jr.'s story, there is no denying The Thing '51's rightful place in sci-fi/horror film history.